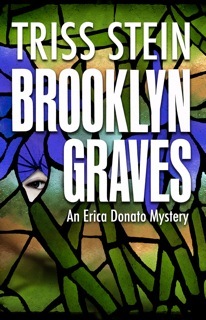 Please welcome guest author Triss Stein with her new release, Brooklyn Graves. One lucky person who leaves a comment will win a copy of one of her books, so lurkers, don’t be shy! With every new book a writer has the challenge of writing something as good or better than the last one. In a series, as most mysteries are published these day, the special challenge is how to explain enough to interest the new reader, and not bore to death the reader who already knows the back story. With Brooklyn Graves, my second book in the series, and with the work in progress, I have an extra challenge. The underlying idea for this series is to write books set in Brooklyn neighborhoods, with the stories woven around the unique character, history and issues of each. The first, Brooklyn Bones, was set in my own neighborhood. An area with beautiful architecture and parks, and all the issues that come with gentrification, it had plenty of old and new tensions to use in a story. And it was all right outside my door! No research required. Can you see where I am going? I never thought of setting all the later books there too, turning it into a kind of urban version of Cranberry Cove or St. Mary Mead. So for Brooklyn Graves I had to look further. Years ago, I had read some news items about a series of crimes taking place in some of New York’s most elaborate cemeteries. They were not creepy; this is not body snatching. In fact, they were almost comical and the idea was irresistible. With Brooklyn home to Green-Wood, one of the grand cemeteries of the 19th century, a place so lovely people used to take carriage rides there and have picnics, I had my special setting and it was a famous place, easy to research. The challenge came with my need to have a manual worker who was a friend of my protagonist. That kind of work is most often done in New York by immigrants. Who could he be, this character? How could I write him and sound truthful? With English that has the correct foreign ring to it? Would I know the difference between a Puerto Rican and a Mexican accent? Between Jamaican and Trinidadian? Let alone the typical family interactions, standards, and fears of another culture? While some human emotions seem universal, they are always expressed in a local fashion. The answer was to make him Russian. I have known a lot of Russian immigrants. I am familiar with Brighton Beach, the large Russian neighborhood now nicknamed Little Odessa. And I had people to ask if I was not sure about a detail. And though Russian immigrants are often better educated than some others, lack of English or lack of US certifications might keep them in manual jobs. My story took a whole new turn that I had not even planned. Did I succeed? I will learn that from my readers. The work in progress is the same challenge magnified. I wanted to write about the history of a very rough, poor neighborhood where I worked for a time, long ago. It wasn’t till I started writing that I realized that – duh!- I don’t know anything about it as it is now. Is it still tough, gang-ridden, depressed? Is my knowledge of street slang hopelessly outdated? (Of course it is) Does it still produce boxers and drug dealers? Finding out is the first challenge. Making it come alive on the page is the second. Look for the results next winter. Suddenly, all of this, from the tragic to the merely eccentric, becomes part of Erica Donato’s life. As if her life is not full enough. She is a youngish single mother of a teen, an oldish history grad student, lowest person on the museum’s totem pole. She doesn’t need more responsibility, but she gets it anyway as secrets start emerging in the most unexpected places. In Brooklyn Graves, a story of old families, old loves and hidden ties merges with new crimes and the true value of art, against the background of the splendid old cemetery and the life of modern Brooklyn. Triss Stein is a small–town girl from New York state’s dairy country who has spent most of her adult life living and working in New York city. This gives her the useful double vision of a stranger and a resident for writing mysteries about Brooklyn, her ever-fascinating, ever-changing, ever-challenging adopted home. She is inspired by its varied neighborhoods and their rich histories. The first book in the series, Brooklyn Bones, is about the discovery of body as a brownstone is being renovated in gentrifying Park Slope. The next is Brooklyn Graves in 2014. It is about historic Green-Wood Cemetery, Tiffany glass, a turn-of-the -last century mystery and some up-to-date crimes. It is due out in February 2014. Writing mysteries is Triss’s third career. She started out as a children’s librarian with the Brooklyn Public Library system, which is when she started learning about all those neighborhoods. Later she transitioned into business research at places as diverse as McKinsey, the global consultancy, and DC Comics. She is the chair of the Mystery Writers of America/New York chapter library committee. The series sound fascinating, especially to this other alumna of Brooklyn Public Library. Good luck with the series! Hi, Suzanne. Thanks for responding. When were you at BPL? I was there a long time ago, shortly after the dinosaurs stopped roaming Prospect Park. I did love it and only left when I realized I was paying more in child care than I was earning. Sneak preview: the next book- still in the early stages- will have some important scenes in a branch library. Hi, Triss. I was at BPL a long time ago as well–the mid to late 70’s. I had similar child care issues. When I think back, I’m amazed how little the libraries (not just BPL) paid to staff with Masters degrees. Are you aware that the main branch is in the shape of an open book? Suzanne, we overlapped. I was there from 1970-77, then maternity leave and then back for 79-80. My 2nd child was born in late 1980 and after that I went into the business world. Hi, Sherri Thanks for stopping by and leaving a comment. Loved your piece, it’s piqued my interest in the series. Also loved your response, you are too funny. I look forward to reading your series.